Red and white currants are basically derived from two European species, Ribes rubrum and R. spicatum. Red currants sometimes occur as garden escapes from bird-sown seed and R. rubrum is also found naturalized in many areas. The fruit buds are produced in clusters at the base of the one-year-old shoots and on short spurs on the older wood. Because of this fruiting habit there is a permanent framework of branches, unlike the black currant for which a succession ofyoung wood is needed. The red currant is usually grown as an open-centered bush on a 4-6 in stem or leg, rather like a miniature apple tree, with a height and spread of about 5-6 ft. This method of growth makes cultivation around the plant easier and keeps the fruit clear of the ground. The red currant is also grown as a single or multiple cordon, and, more rarely, as a standard or fan. A well-grown bush should yield at least 8-10 lb of fruit and a single cordon about 2-3 lb. Plants should bear well for at least ten years. The smooth-skinned, glistening red berries are attractive and ideal for jelly, pies, juice and for wine making. Red and white currants are, like black currants, alternate hosts to white pine blister rust, and so have planting restrictions in many states. The state agricultural extension service or forestry department should be consulted before ordering. The white currant is a mutation or sport of the red currant and for cultural purposes is treated in exactly the same way. 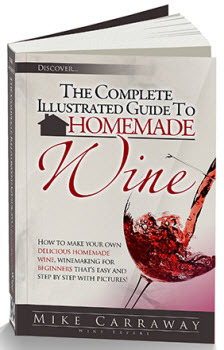 The berries, of somewhat milder flavor than the red, are also useful for jelly and for wine making. Soil and situation Ideally, the soil should be neutral to slightly acid (about pH 6.7). Red and white currants are less tolerant of poor drainage than the black currant but, provided the soil is reasonably well drained and not deficient in potash, they are tolerant of a wide range of conditions. The flowers of the red and white currants are hardier than those of the black currant, so it is a useful plant for north-facing walls and fences and for shaded areas, provided the soil is not dry and over-hanging trees do not drip on the plants. They grow in zones , 3-8. A sunny position is best if the berries are to acquire their full flavor. The site should be sheltered but not a frost pocket. Soil preparation Prepare the soil in the fall or late winter by clearing away all weeds. 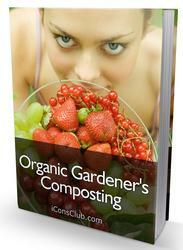 Apply a light dressing of well-rotted manure or compost about 11/2 in thick over the whole area. If farmyard manure or compost are not available, apply a 1 in layer of damp peat. If the ground is fairly clean, single dig the dressing in; but if weedy, double dig the area. Rake in a balanced fertilizer, such as 10-10-10, at the rate of 2 oz per square yard and sulfate of potash at 1/2 oz peryard. Selection of plants Buy plants from a reliable source because certified stock is not available. One- or two-year-old bushes are usually supplied by the grower. Select a plant with a clear stem, or leg, of about 4-6 in with a head of about 3-6 evenly balanced shoots. The single (or multiple) cordon may be two or three years old and should consist of one (or more) straight stems with sideshoots. Planting and spacing Plant during the dormant season in March or April, unless the plants are container-grown, when they can be planted at any time. Space bushes 5 ft x 5 ft (5 ft x 6 ft on fertile land) and single cordons 15 in apart, or 12 in apart on light soils. Allow 12 in between each stem of a multiple cordon; for example, double cordons should be planted 24 in apart from the main stem at ground level. Cordons should be trained up a vertical cane for straight growth and support. If planting cordons in the open, before planting erect a wire fence with horizontal wires at 2 ft and 4 ft and tie canes to the wires at each planting station. Next, take out a hole large enough to contain the roots well spread out, and plant the bush or cordon to the same depth as it was in the nursery. Fill in and firm the soil. Feeding and watering Each March apply a balanced fertilizer, such as 10-10-10, over the whole planting at 2 oz per square yard and sulfate of potash at joz per square yard. On light soils also apply a mulch of rotted manure, compost or peat 2 in thick around each bush. If manure, compost or peat are not available, apply sulfate of ammonia at 1 oz per square yard. Water copiously in dry weather. 1 In late winter, dig in a 11/2 in layer of well-rotted manure. Then, rake in a balanced fertilizer, such as 10-10-10, at 2 oz per square yard and sulfate of potash at 1/2oz per square yard. 2 In early spring, dig a hole large enough to take the roots well spread out and plant the bush to the same depth as it was at the nursery. Delay planting if the ground is very wet or frozen. 3 Each March, apply 10-10-10 at 2 oz per square yard and sulfate of potash at 1/2ozper square yard. On light soils also apply a 2 in mulch of rotted manure, compost or peat around each bush. 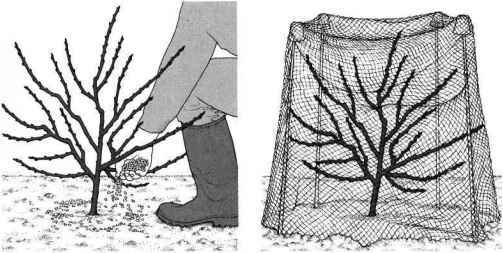 4 During the winter, protect the fruit buds with netting against attack by birds and frost at blossom time. Remove it during the day at flowering time.